New Delhi, India -- Buddha Purnima is the anniversary of the night of the great awakening, which turned seeker Siddhartha into the Enlightened Sakyamuni Buddha. It also marks his birthday as also the day he entered into eternity after completing Sahasra Chandra Darshana, or 1000 full moon days on the full moon day of Vaishaakha. To billions the world over yearning for peace and well-being, the Tathagata, the teacher who ?walked his talk?, is a living presence through his teachings. Moreover, Buddhism is once again on the rise in the land of its birth. Apart from the spurt in vihara-building among Dalits and the votaries of the Bahujan Samaj, consider just one example: Vipassana or the technique of mindful meditation. A household word today, it?s taught not just in specialised retreats like Igatpuri and Bodh Gaya, but also in prisons like Tihar Jail and management institutes. Vipassana, which means ?seeing things as they really are?, was practised way back in the mists of time before being rediscovered by the Buddha, who used it to reach enlightenment. Vipassana then disappeared again, and was lost to India 500 years after his passing. But a chain of teachers in Burma preserved the technique in its purity for 2,500 years. Satya Narain Goenka, aka Goenkaji, was authorised to teach the technique in 1969. His teacher was independent Burma?s first accountant general Sayagyi U Ba Khin. He used to conduct meditation courses in his office premises to tackle corruption. 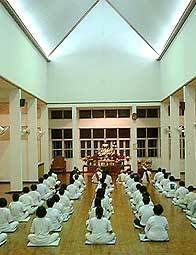 ?The time clock of Vipassana has struck?, U Ba Khin declared when Goenkaji started teaching in India. He was professing an ancient prophecy that the technique of Vipassana would return to India and spread to the rest of the world. Vipassana has spread rapidly indeed; mostly by word of mouth, in cultures as diverse as Britain, Russia, Japan, Mongolia, Brazil, Iran, Thailand, China and Scandinavia. In India, central and some state governments offer paid leave for their staff to learn the discipline. Courses are organised for students of technological powerhouses, and for scientists. Leading business schools send entire batches of management trainees for Vipassana courses. The recent discovery of its health benefits by western medicine, under the patronage of His Holiness the Dalai Lama, is the latest chapter in the shining saga of Vipassana.